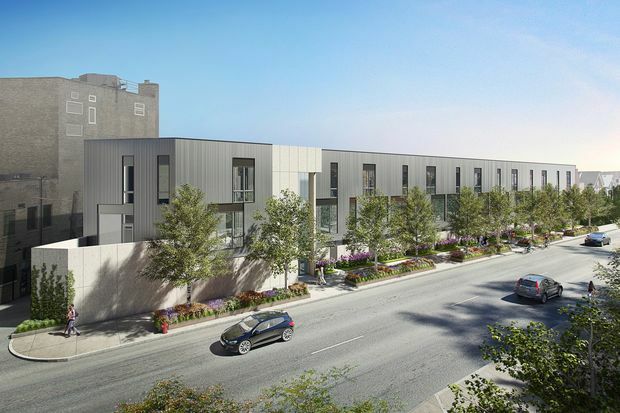 WICKER PARK — A row of modern $1 million town houses with private terraces and out-of-view garages is coming to a side street on the border of Wicker Park and Noble Square — one block from the busy Milwaukee Avenue and Division Street intersection. "So far, the reception has been outstanding. We've had lots of interest and excitement" from prospective buyers, said Jan Smith, a real estate agent who is selling the soon-to-be built homes for Chicago-based developer Henry Street Partners. 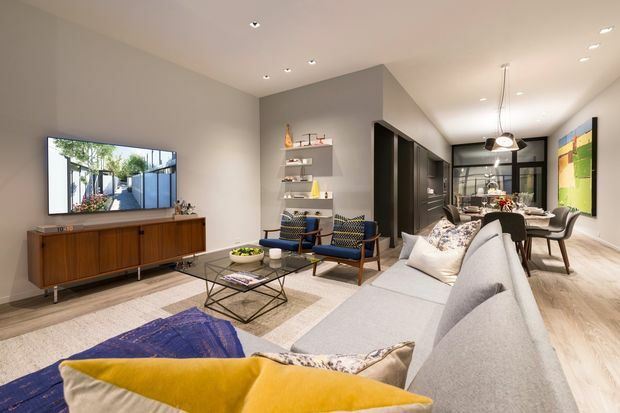 A sales gallery open from noon-2 p.m. Saturday and Sundays offers a full-scale model home inside the remodeled Fifth Third Bank across from the Polish Triangle. The model in the bank building is a replica of what 20 of the 23 town houses, which hit the market two weeks ago and range in pre-construction price from $978,280 to $1.95 million, will look like. "Instead of looking at plans, you can walk through and feel the experience," Smith said. The town houses will be in one long row at 1220 N. Bosworth Avenue, taking over the bank's former parking lot and a drive-thru ATM. The homes are aligned in two rows, separated by an interior elevated courtyard landscaped with stone pavers and white birch trees. The courtyard sits one level above a center drive providing access to each home’s private (and out of view) garage, Smith said. Previously, Henry Street Partners wanted to build a 12-story, 32-unit condo tower at the site. But after getting mixed reactions from neighbors who were concerned about the height of the tower on a residential side street, that plan apparently was scrapped. Construction on the homes is slated to start within the next three months, and if everything goes as planned, the homes will be ready by early 2019, Smith said. 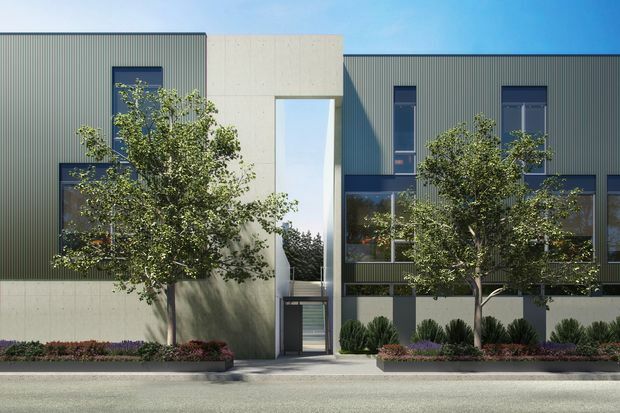 The homes will be designed by Wheeler Kearns Architects, who also partnered with Henry Street Partners to design a modern apartment tower at 1611 W. Division St. that opened in 2013. Other local projects from Henry Street Partners include the MiCa apartments at 2261 N. Milwaukee Ave. in Logan Square and Bucktown's Willow Court Townhomes. Smith said the town houses would be ideal for a professional person or couple who want "great access to transportation" since the homes are within two blocks of the CTA Blue Line Division station and the Kennedy Expy. ramp, and just off of Milwaukee Avenue, which is a popular bike, car or bus path to Downtown. 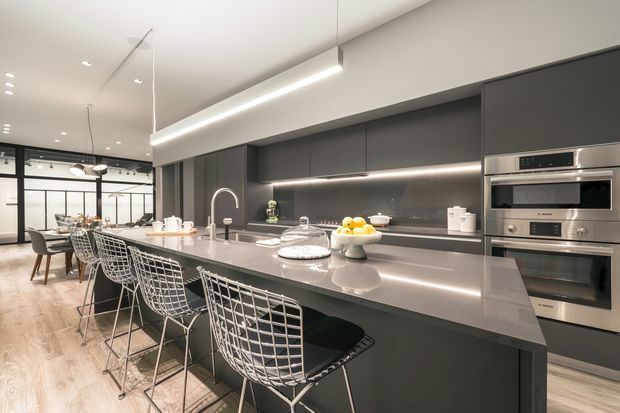 In a news release earlier this month, Rob Buono, principal of Henry Street Partners, said, “There is strong demand for contemporary new construction in Wicker Park and its surrounding neighborhoods." 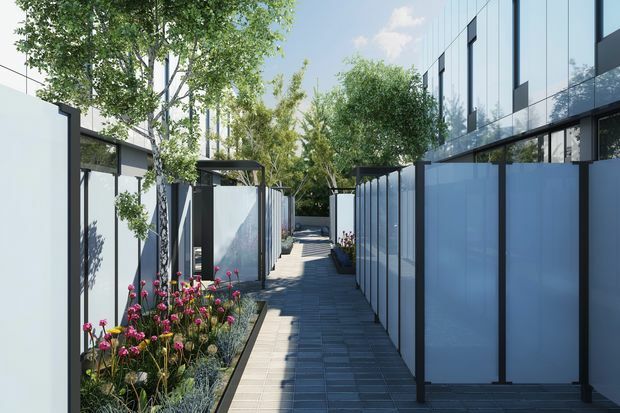 Off the main living level, each home will have an approximately 200-square-foot private terrace, enclosed by a steel frame with solid metal and translucent synthetic panels. Each residence will have three levels, three bedrooms, three full baths and an attached two-car garage. View the floor plans here, or on the homes' website.